Anti-fascist Afro-Italian partisan Giorgio Marincola lived a brief but heroic life. Born September 23, 1923, in the south central coastal town of Mahaday in what was then called Italian Somaliland, he was the son of Italian military officer Joseph Marincola and a Somali woman, Aschiro Hassan. His father, unlike most white colonizers who had children by native women, insured that his son and a younger daughter, Isabella, would be Italian citizens and packed them off the seaport town of Pizzo Calabro, Italy, to be raised by relatives. At age ten, Marincola was sent to Rome to reunite with his father who had married an Italian woman and had two additional children. An exceptionally bright student at the Umberto I high school, he was attracted to the ideas of his leftist history and philosophy professor Pilo Albertelli, a co-founder of the underground anti-fascist Action Party (Partito d’Azion) which resorted to violent guerilla activity in 1943 when the Nazis declared Italy an occupied war zone. Though Marincola had begun to study medicine with the intention of returning to Africa to treat those stricken with tropical diseases, he felt compelled to join the armed wing of the Action Party. He participated in raids against the German military in the provinces of Rome and Viterbo, rising to the rank of lieutenant in the partisan force. Fortunately, after Marincola’s three-month imprisonment, the Nazi SS abandoned its Bolzano concentration camp where he was last incarcerated, but instead of seeking safety in Switzerland, he attempted to attach himself to a partisan faction in the Fiemme Valley in the northern Italian province of Trento. At an encounter with retreating German soldiers at a checkpoint on May 4, 1945, in the vicinity of the now extinct Alpine town of Stramentizzo, he was shot and killed along with twenty-five other partisans and civilians, reputedly the final Nazi massacre on Italian soil. Ironically, his death came two days after Nazi Germany surrendered to Allied forces in Berlin. In recognition of Marincola’s heroism and ultimate sacrifice, in 1953 he was posthumously awarded his nation’s highest military honor, the Gold Medal for Valor (Medaglia d’Oro al Valor Militare). 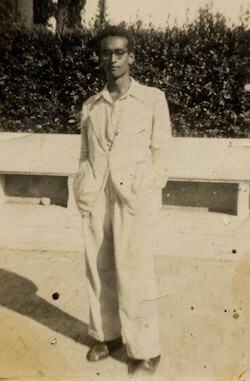 In attendance at a 2015 conference in Rome commemorating Marincola’s death seventy years ago was his nephew, writer Antar Mohamed Marincola, who reflected on his uncle’s life and legacy. “Storia Giorgio Marincola,” at http://www.razzapartigiana.it/?page_id=8; “Giorgio Marincola, First Somali Mulatto,” at http://www.somalinet.com/forums/viewtopic.php?t=327444; Michele Robecchi, “Giorgio Marincola:Razza Partigiana di Dacia Valent,” at http://digilander.libero.it/anpimuggio/ANPI/Storia/Voci/1945/5/4_Giorgio_Marincola.html.